- 46" Samsung Flat Screen TV, with Chromecast, stream Netflix, etc. Entire 2 bedroom 1 bathroom home with garage to yourself in an ideal location in University City. What guests love about my home is the proximity: everything is a 2-5min drive away! Restaurants (The Loop! ), shops, Washington University, & Forest Park! They also love the cozy sun room & nearby dog park. Some guests have commented negatively on the neighborhood, as the home is on a main street, but it is a safe, quiet family street, in the midst of gentrification & getting better all the time. Beautiful, updated home with nice wood floors. 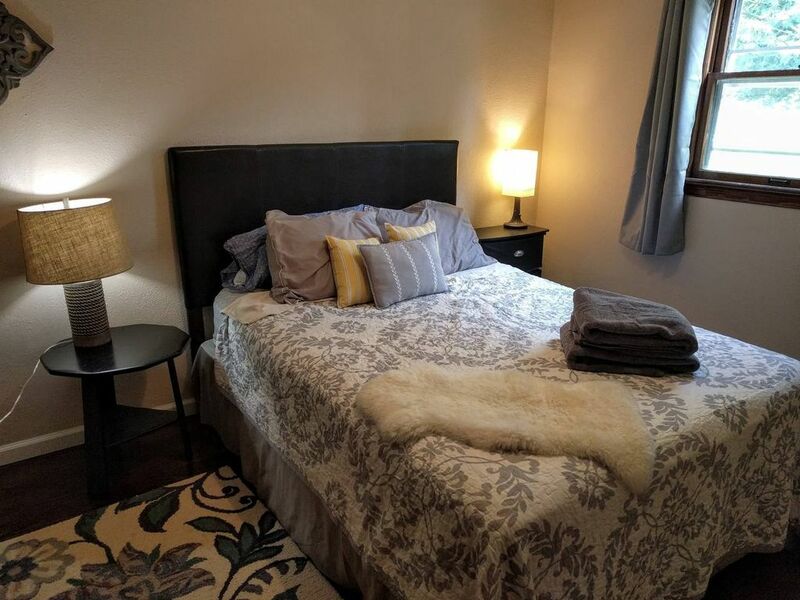 Two bedrooms, each furnished with a queen sized bed that comfortably sleeps 2 and dresser plus closet for clothing storage. The couch is wide and long enough to sleep one more comfortably. Grassy backyard (not fully enclosed, backs up to a stream) great for children or people traveling with pets. Two homes down from the community garden and University City dog park. Washer and Dryer located in the basement. The living room has a 46" Samsung Flat Screen TV, with Chromecast which transforms it into a smart TV to easily stream Netflix, Hulu, YouTube and more easily from your smart phone or computer. A super comfy couch and 2 sitting chairs. Sun room sitting area off of the kitchen. Perfect cozy reading nook. 1 car Garage is available for car storage for guests. 1 car also fits in the driveway and there is ample street parking. $50 Pet fee, we can only accept cats and hypoallergenic dogs at this time. Simply let me know that you are traveling with an animal and I will adjust the rate for you. Please clean up dog droppings in the yard. You have full range of the home. 2 bedrooms, 1 bathroom, living room, kitchen, garage. I will only be interacting with you via email and phone/text. The housekeeper is also available for emergencies and I have a great handyman if anything needs work. Excellent location! 2-3min drive to anything on The Loop (restaurants, shops, movie theater, concert hall, etc. ), 5min drive to Washington University, 5min drive to Forest Park (bigger than Central Park in NYC with museums, a zoo, golf course, etc.). Also easy access to Public Transportation. Only 15min from the airport! Although a car is recommended you could rent a bike or take Ubers to get around. The home is a walkable distance to the Loop but I wouldn't rely on that alone. The Summers are hot and humid and the Winter has snow, plus walking is not recommended at night. Uber/Lyft are great options if you are carless. If you are driving cross country, this is an excellent choice because you have a secure garage to leave your packed car in. Also have close access to public buses and the metrolink. $50 Pet fee, we can only accept non shedding dogs and cats at this time, that are traveling with a crate/carrier. Simply let me know that you are traveling with an animal and I will adjust the rate for you. -Please lock them in their crate if they will be home alone. I am originally from Maui, Hi. I currently live in Boulder, CO and love to travel and housesit all over the world. I was brought to St. Louis for a wedding of a dear friend and fell in love with it's history, culture, and sprawling parks. House was the perfect size for our family of 3. Our goal was to have a place of comfort and to be able to prepare breakfast and lunch meals. Kitchen was well suited to meet our needs and the beds were comfortable. Thank you for this glowing review Derrick! I hope you had a safe trip home and that you will visit us again. Had a wonderful 3 night stay at this property. Home was clean and exactly as advertised. Would definitely recommend it to anyone. Thank you Jade, we hope you visit us again on a return trip to Saint Louie! First, we really liked the house. its comfortable with space to see friends, sun room is nice. Ignore concerns about the neighborhood, its a standard city starter home neighborhood. We will stay again. With that said, a few other caveats. One, the tv runs only on Chromecast. Make sure you have a gmail account and netflix or something similar on your phone, otherwise you will be hunting for a redbox. Second, the kitchen is low on supplies. We had two spoons, only two wine glasses, very small trash can and only one trash bag, no recycling bin. Three, it is not two blocks from the loop. I was walking to Wash U, I mapped the walk and measured the difference. if you take the Ackert Walkway, which I recommend, it is 0.6 from the Chuck Berry statue to the house. Easily walkable but not two quick blocks. There are also a few maintenance issues, small ones, that arent dealbreakers but fixing them would be wise: broken outlet covers in the bedroom, burned out lightbulbs, a loose front shutter that bangs against the house in the wind. Some rooms have some paint issues and poorly done drywall repairs. These things are minor, but repairing them would go a long way in making this rental more popular. We enjoyed our stay. Hi Tara, Thanks for taking the time to write the review, although I wish you just shared these items privately. Chromecast makes the TV a smart TV which easily works from any phone or computer after downloading an app, no Redbox necessary. It seems as though the guest forgot to check the dishwasher, as all the utensils/cups were clean in there. We have a standard 13gal trash can and an 8gal recycling bin in the kitchen. The Loop is just to the end of our street, down Kingsland Ave and you are there. It's 2 long blocks and yet I will happily change this to 3 blocks. Thank you for the notice about the small fixes: outlet cover, light bulbs and tightening the shutter is happening now. This home is a clean, convenient and simple space to stay while visiting St. Louis. The garage parking was especially appreciated. It was a really cute house. Very clean. It only cost $7 on Uber to get to the loop. There is a clean and nice Schnucks one block away. Really nice little sunroom to hang out in. Overall, it is a great place. Cozy home close to everything! The home is cute and really cozy. Perfect for a friends weekend in St. Louis. It's an extremely urban neighborhood close to Washington University. I will caution you that the garage is extremely narrow (not surprising based on the age of the home). The home is extremely clean and well appointed with everything you will need during your stay. I especially liked the skylight in the family room!